Need a great chest workout to push you to the next level?! Check out this killer chest workout video that focuses on muscle hypertrophy , which will help you increase muscle size most effectively. Workouts that focus on muscular hypertrophy cause your individual muscle fibers to increase in diameter. So if your goal is to simply get bigger and look better, focusing on the hypertrophy phase would be most fitting. Most competing bodybuilders spend most of their workouts in the hypertrophy phase. The hypertrophy phase typically consists of 8-12 reps per set with 1-2 minute rest between sets with most, if not all the sets, going until failure. For more information on the different rep schemes and the benefits of each type of workout, including a more in depth article on the benefits of hypertrophy workouts, check out the article on repetition schemes and muscle fibers. In addition to being a chest workout, this workout will also hit your triceps as a secondary muscle. Watch the killer chest workout video below and then scroll down to the bottom of the page for the workout in written form. So simply watch the video, print out the workout in written form, and get to the gym and start working out! Make sure to use good form throughout the exercise and if you feel your form start to go bad, that is your sign to stop the exercise. 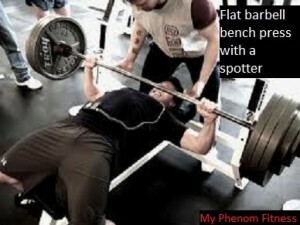 Do not risk an injury to get a few extra reps in, as tempting as that may be. If you have any questions about this killer chest workout video, don’t hesitate to ask! Either leave a comment or email us at phenom.fitness.and.health@gmail.com. And for complete workout routines, make sure to check out the men’s workout plans and the women’s workout plans sections of the site.